On 30th July, 2014, Eastbourne Pier was badly damaged when fire broke out in the pavilion, leaving about a third of the structure gutted. The story was trending on social media to such an extent, that I decided to put together the stories of East Sussex's seaside piers during WW2. Note: this piece was first posted on 3rd August and subsequently updated 19th August 2014. Firstly, the good news about Eastbourne Pier; nobody was hurt and the emergency services did an outstanding job in containing the fire to the area around the pavilion. The extent of the damage can be seen in the photo below, taken the day after the fire. Sadly, Eastbourne is not the only East Sussex town to have had a pier damaged or destroyed in recent years. In 2003, Brighton's West Pier (below) burnt down and was subsequently wrecked in a storm. There is better news for Hastings Pier (below), however. Although only one of the buildings escaped incineration in 2010, restoration work is now well underway. There were five piers in East Sussex on the outbreak of war. From west to east, these were: the West Pier and Palace Pier at Brighton, and the piers at Eastbourne, St. Leonards and Hastings. While these seaside structures enjoyed happy scenes in peacetime, their wartime experience was very different. As we shall see, death and injury occurred on some, and not all managed to survive the trauma of war to receive visitors again. It wasn't until 10th May, 1940 that the Sussex coastline found itself potentially on the front line as the Germans launched their offensive in France and the Low Countries. The earliest mention of the piers is in reference to their partial demolition on 13th May, when a report on Eastbourne, St. Leonards and Hastings Piers was compiled by a Royal Engineers field company based at Robertsbridge. The RE at Newhaven were inspecting the Brighton piers with a similar view; a Royal Artillery Regiment had already posted guards armed with Lewis guns at them. Two days later, orders were issued to actually proceed with preparations for partial demolition of all these piers. The reason for the proposed demolition was simple; in the event of invasion, it was feared that the Germans might try and use the piers to disembark troops and supplies from their ships. The Germans, of course, were well aware of the piers; the photo at right is a prewar seaside postcard of Eastbourne Pier used for intelligence purposes as part of their invasion planning in 1940. Belts of Dannert wire were erected at the pier heads as the work in placing explosive charges theoretically proceeded; Eastern Command stipulated that one bay below low tide level and one above high tide should be removed. The plan at this time was not to blow the charges immediately, but within three hours of the invasion warning being received. Then, on 22nd May, the preparations were thrown into confusion as the Admiralty got involved. As the Royal Navy was responsible for all defensive matters below high water mark, it was held that the demolitions were under its control. Having been given orders by the Senior Naval Officer at Newhaven, the RE Company Commander reported his concerns to his Divisional superior, who promptly countermanded the Navy's orders. The RE were not to undertake the demolitions on the Navy's orders, but, when required, the work was to be done by civilian contractors under RE supervision. The following day the situation changed and the engineers were instructed to begin preparations; the orders for demolition were written out; the army would be responsible for ordering the ultimate blowing of the charges. Explosives were collected and the RE finally set to work; at 18:30 on 24th May, the Brighton pier demolition charges were reported as completed. At 06:00 the following day, the piers at Eastbourne, St. Leonards and Hastings were also ready for "hasty demolition." Then on 27th May, the situation changed yet again; the detonators and explosives were to be removed from the piers! This was because it was expected that the British Expeditionary Force would use the piers to disembark troops from the evacuation of Dunkirk. Of the Brighton piers, the BEF was to land at the Palace Pier. The local commander, not yet aware that the explosives were to be made safe, was fearful that they might mistakingly land at the West Pier instead. This concern was justified; the following week, the RE officer responsible for the West Pier demolition was found to be stationed on the Palace Pier in error! The Dunkirk evacuation ended on 4th June without the Sussex piers being used. On June 23rd, Eastern Command issued fresh instructions regarding the demolition of piers. The Admiralty had struck back in the argument over who was responsible for the piers, and had pointed out that the first warning of an invasion might be German craft actually landing alongside the piers. This would mean that it would be too late for the army to insert the detonators and blow the charges. It was therefore preferable to cut out a bay from each pier as soon as possible to avoid this scenario. The problem was this; most piers were privately owned and so in order to "damage" them without an invading army actually attempting to land, they had to be requisitioned first. This was done under Defence Regulation 51, which gave the army full possession of the piers, but with compensation for damage payable to the owners. 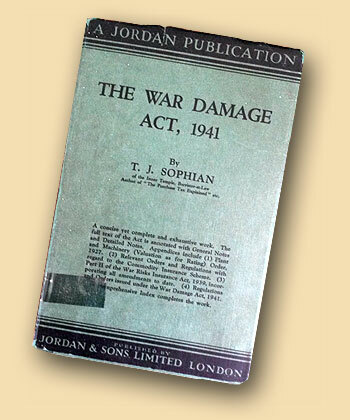 Matters were later clarified by the War Damage Act, 1941 which stated that damage incurred due to preparations to meet enemy attack (regardless of whether the attack came) could be classed as war damage. The story of the East Sussex piers doesn't end here, or even with the demise of the invasion scare though; each has its own story, which are detailed below. 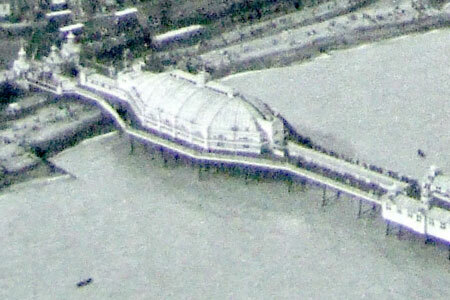 Eastbourne Pier briefly appears in profile in the 1943 film Millions like us, clearly showing the missing section. I've replicated this in the Photoshopped photo below; I've also removed some of the postwar kiosks between the pavilion and the gap. In addition to the gap being cut, two buildings on the pier (presumably near the entrance) were scheduled as demolitions. On 28th June, a Corporal Osgood was part of the Royal Engineer party at the pier when what appeared to be a mine was seen floating towards the structure. Swimming out with the intention of guiding the mine through the legs of the pier, he subsequently found that the "mine" was actually an empty tar barrel! The war diary includes a note on the incident, with a commendation from the Divisional Commander on his "praiseworthy intentions." By October 1942, a 40mm Bofors anti-aircraft gun had been stationed on the pier to help tackle the tip-and-run raiders that flew in low and attacked vulnerable coastal towns. Situated between the pavilion and the gap, it undoubtedly saw much action. 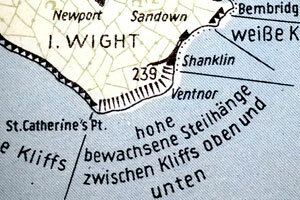 The map at right is from a German Befestigungskarte of 1940, showing the two piers and marking the locations of the gaps cut in them, similar to the work done at Eastbourne. The map shows barbed wire, dragons' teeth, roadblocks and the locations of some pillboxes. German interpretation of aerial photos was often quite suspect along the seafront towns, however, with promenade shelters being mistaken for pillboxes. One pillbox the Germans didn't spot was built under the landward end of the West Pier, as seen in the photo below. "In the morning a Lewis Gun and rifle were taken down to the partially completed pillbox at the West Pier and the height of the firing aperture and sighting of the weapons tested." 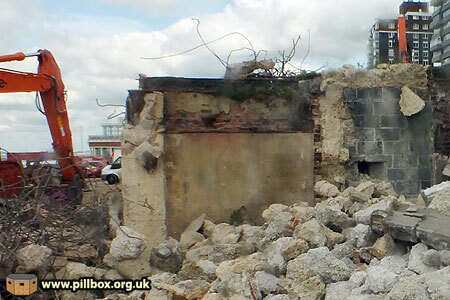 Sadly, this particular pillbox was demolished 24-26 June 2014 - a year in which we should know better than to destroy our heritage. This pillbox was unique, given its association with the West Pier and that it was the last seafront pillbox on a promenade in East Sussex; all the others were removed in time for the 1945-46 tourist season. The photo below shows the remnants of the pier's supporting pillars and demolition of the pillbox. The Palace Pier can be seen in the background; as of last Wednesday, it is the only pleasure pier in East Sussex open to the public. The unit guarding the West Pier wasn't only engaged in testing the pillbox's arcs of fire though. On 31st May 1940 an RAF carrier pigeon was caught on the pier bearing the following message: "Released from Bircham Newton 1745 hrs 28th May." By September 1940 a new brigade was in the Brighton area, and so the piers changed hands. 1. Both piers are cut, rather severely. 2. 'What the butler saw' and other such machines have apparently been removed, much to my regret. The humour seen here is highly irregular for a formal document and given the gravity of the situation. However, the seaside jollity doesn't continue. The West Pier (and possibly others) were booby trapped to catch out any unwary invader. 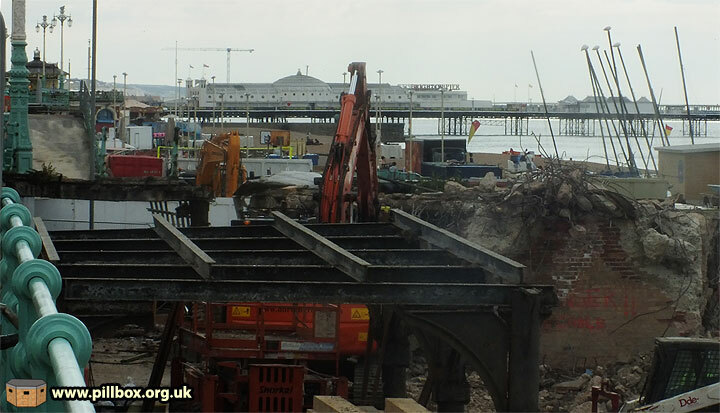 Mr. Miller is making a recce of the demolitions on Brighton Pier. This pier is literally a maze of booby traps so the work of checking them is dangerous. 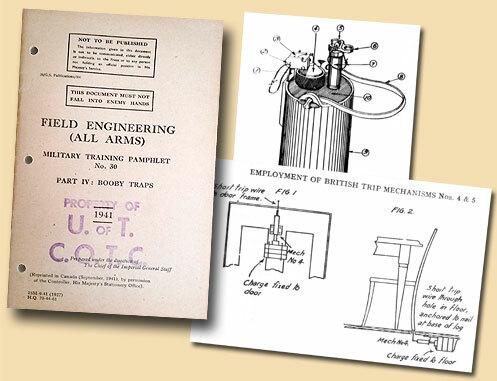 The manual at right shows a shrapnel mine and some of the ways in which booby traps could be set; pressure switches under floors or stairs and pull switches that activated when a door was opened. Inevitably, the time came when these devices had to be made safe and, for the West Pier, that was 10th September 1943. Tragedy befell the bomb disposal squad who were carrying out this work when Lieutenant Revis and Corporal Marnoch were both seriously injured whilst removing a booby trap. Revis was struck off the company's strength on October 9th, having spent 28 days in hospital to that date. It appears that both Revis and Marnoch were 'lucky' enough to escape with their lives and survive the war. Others in their Bomb Disposal Company did not. Two men had been killed the previous month whilst working with mines and fuzes. Six more were killed on 30th September whilst clearing beach minefields at Angmering, with another four fatalities clearing the Shoreham minefields in October and November. 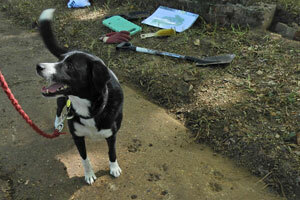 At least another seven were killed clearing Sussex minefields in 1944. All victims of explosive devices laid by the British Army in 1940-41. 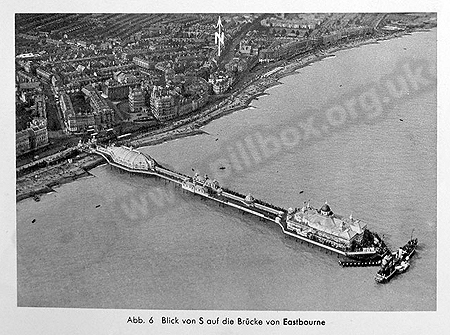 The photo below was taken by the Luftwaffe in 1940 and shows both piers, with St. Leonards on the left. St. Leonards Pier was the scene of another tragedy; on 4th October 1940, three high explosive bombs fell on the landward end, killing Private Stanley Beer of the Devonshire Regiment and injuring three of his comrades. Both St. Leonards and Hastings had had their detonators removed in the wake of the Dunkirk emergency; they were back in position by 20:00 on June 5th. Three weeks later, orders were received to remove the decking from both piers. An 18ft gap had been cut in St. Leonards Pier using oxy-actylene equipment by July 12th, but the completion of the job is not recorded as complete until 23rd August. However, both piers had been cut enough that, that by 17:00 on 1st August, the detonators and charges had finally been removed. The cutting of the girders at St. Leonards had proved valuable to the army though; some RSJs measuring 22' x9" x4" were salvaged and an RE unit used three of them to build a roof for a field gun emplacement at Rye. 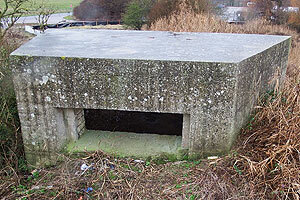 A year later, another Royal Engineers Field Company managed to build overhead cover for 12 artillery emplacements using RSJs from St. Leonards. It's quite likely that similar reuse of materials from the other piers took place, but is not explicitly recorded. Sadly, St. Leonards Pier did not reopen to the public after the war; the gap, the bomb damage and a later fire sealed its fate and it was completely removed in 1951. 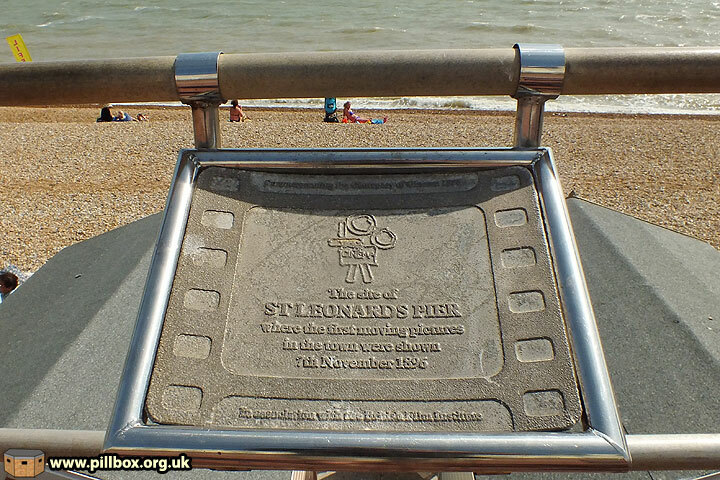 The site of the pier is marked today by a plaque on the promenade railings (photo below), commemorating the first showing of moving film in the town in 1895. 13th October: No.3 Section started work on job H.P. at Hastings Pier, where Major Woods, Captain Turner and Lieut. Love met Lieut. Evers at 08:30 hrs, who explained the job required, i.e., the screening off of the lower part of the pier. About 30% of the job was completed today. The following day, job E.P. at Eastbourne Pier was begun, again, to screen the lower part of the pier. Both jobs were to be completed by Saturday 17th October. It is assumed that this entailed covering the piles and strutwork beneath the decking. The photo at right is a close-up of the postcard shown above; you can see underneath the pier even from an aircraft. On 15th October, Hastings was 80% complete and Eastbourne 40%, but progress had been held up by a lack of cordage. The 17th October deadline passed and it was another two days before the necessary cordage was delivered to the piers. The work appears to have been completed around this time; nothing more is said of the matter until 7th November when the screens at both piers were lowered in tests. 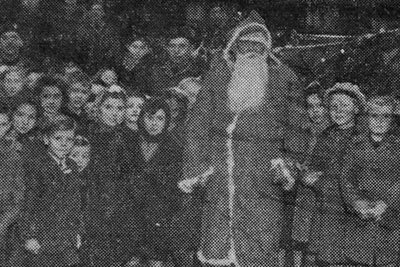 Orders were received on 10th November that the screens must be lifted by the following night, which was duly done in the morning of the 11th. The Divisional Engineer records "two sections rolling up the camouflage on Hastings and Eastbourne Piers. The job is not the success it might have been." The Engineers at Brighton recorded water action damaging some of their screens. What were the screens for? I have no idea! The documents only give the above information. I can only assume that it was some sort of unsuccessful trial at concealing something under the pier. The screens were presumably at the shore end, where the cross-braces and risk of beaching would surely rule out landing craft being hidden there. The War Office was very much a paperwork-driven organisation; not only were formal documents and procedures needed to requisition the piers, but also to reverse the process. However, the army was unwilling to derequisition some of the piers under its control. The War Office issued orders to all commands in November 1943, to submit lists of requisitioned piers and whether control of them could be relinquished. As a result, of the 53 requisitioned piers in Great Britain at that time, 18 were found to have no operational value as of December 1st 1943. South Eastern Command's response was that both Brighton Piers and and that at Eastbourne were under its control, as well as some in West Sussex and Kent, stating: "It is NOT considered operationally desirable that any of these piers should be de-requisitioned." This indicates that St. Leonards and Hastings Piers had already been handed back. There had been some great confusion over the latter in 1941 however. 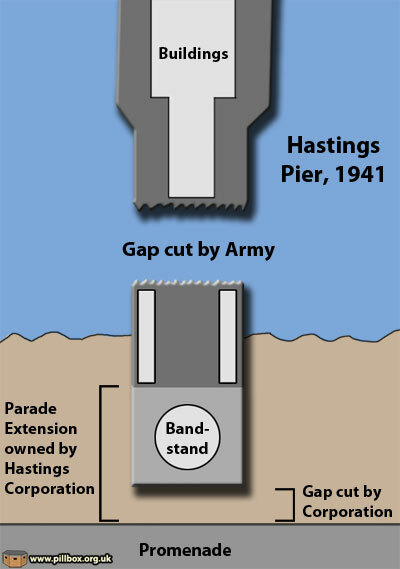 In August, the War Office had noticed that the Hastings Corporation had cut out an new 40-ft section, effectively severing the pier from the promenade. This, it was argued, was contrary to Defence Regulations, as the Corporation had prevented access to property that the War Office might want to occupy. The graphic at right explains the situation and is based on a sketch drawn at the time. Hastings Corporation owned what was known as the 'Parade Extension', but the pier proper was owned by the Hastings Pier Company. Both had been served requisition notices, and the army cut the main gap. The Corporation rejected the charge against them and it was discovered that a local military commander had, in fact, asked them to undertake the work in May 1941, so that the promenade could be completely sealed up with barbed wire entanglements. It is probable that a number of piers, although requisitioned primarily for defence purposes, have been taken into use for normal troop accommodation, storage and other purposes. Owing to the heavy cost, and the necessity of them being made available for public use as early as possible, it is requested that you will investigate the possibilities of finding alternative accommodation where necessary in order that such piers may be derequisitioned. The Hastings Promenade Extension was still the subject of requisitioning confusion in May and June 1945 however. The Corporation believed that compensation would be paid under an 'omnibus' agreement that covered all their property as one process. However, the War Office maintained that the pier was not part of this process and demanded a separate claim form to be submitted. How this issue was resolved is seemingly not recorded! 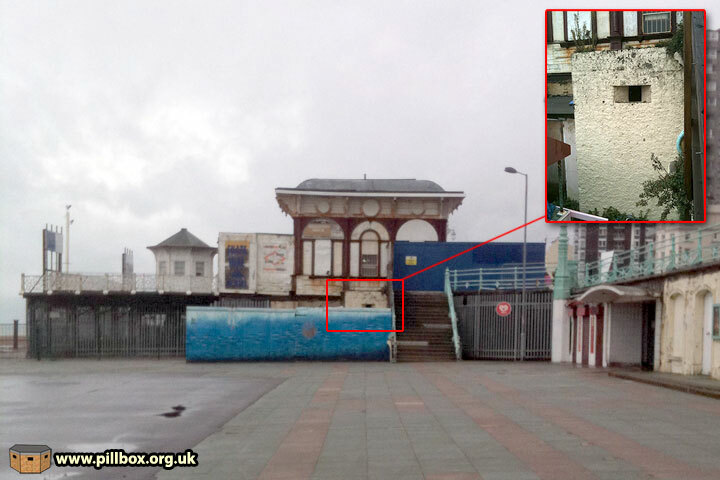 The rehabilitation of Eastbourne Pier, 1944-2015? The importance being attached to allowing public access to piers by the War Office is important. 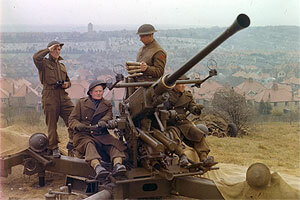 Although the Home Guard had stood down in late 1944 and defence works were already being removed, the European war was not yet over, and yet the nation was already looking towards postwar reconstruction. On 15th September, 1944, the beaches from the Belle Tout lighthouse to Eastbourne Redoubt were reopened, allowing the public access to the seaside after four long years of barbed wire and minefields. However, although Eastbourne Pier's beaches were open, the pier itself was to remain closed. 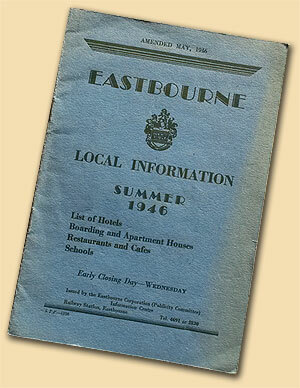 The 1939 edition of the Eastbourne handbook for tourists was a lavishly-illustrated 168 glossy pages including seven photographs in which the pier was shown, indicating how important the pier was to the tourist trade. The May 1946 version (right) perhaps indicates the state of the early postwar world. A rough paper pamphlet of 16 pages without illustration, it simply predicts that a part of the pier will be opened during the summer season. Part of Eastbourne's Pier, used as an anti-aircraft gun-site through the war, has been re-opened this summer. The Music Pavilion is now staging two dances every week, there is a licenced buffet and automatic amusement and games as well. Work is being carried out on the rest of the Pier. The rest is history; Eastbourne rebuilt itself following the carnage wreaked by six years of war, which went far beyond just the damage the pier sustained during those years, as a result of fire in 1970, or the recent inferno. On the strength of this evidence, I have no doubt that the town will bounce back and that the damaged section of the pier will be back in business soon! Fortifications map compiled by German Intelligence from aerial photographs during 1940-41 in preparation for Operation Sealion. Defence works were plotted using a system of red symbols. Barbed wire converted from a spring-like coil of wire into a concertina tunnel by joining the loops to each other by the use of metal tags. Dannert wire could be improvised by using ordinary wire instead of special tags.